Peaks and angles create the star at the top of this gold 5-1/4" star riser that holds the 5" full color martial arts figure. 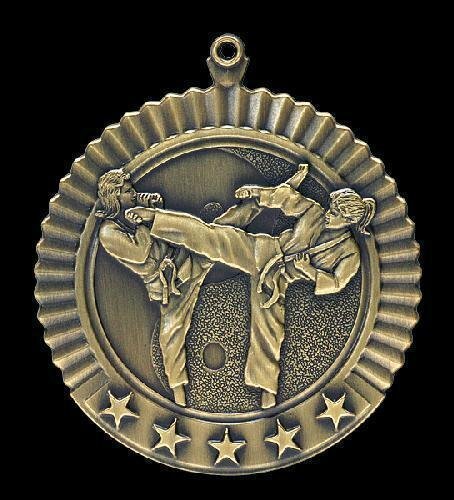 Mounted to a white plastic weighted base, and embellished with a first place trim, this makes an impressive trophy for your martial arts event. This ruby marble designer plaque has gold trim that frames and highlights the face of the plaque. The insert holder is 3" in diameter, and holds a 2" darts Mylar insert. With plenty of room to add a plate to personalize this plaque, its a classic award to recognize achievement. Plaques are available in several sizes and colors. 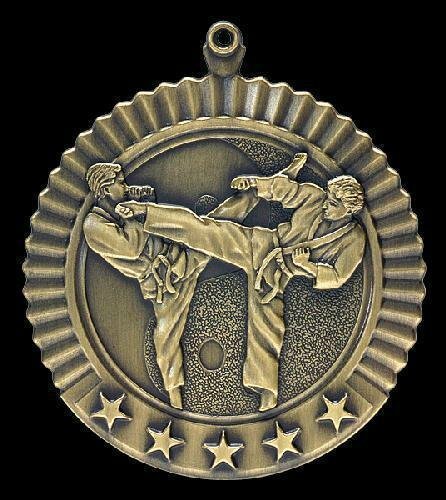 This elegant Star Power Karate Award combines the icon of a star and a person in their Karate Gi in a rich black and gold tone finish. 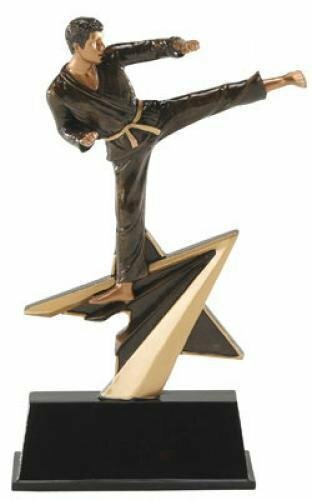 The Karate figure is shown with raised forward leg and one arm forward and the other back in a classic offensive pose This award stands 7" in height while the base on these awards provide plenty of room for whatever your personalization needs may be. This Karate award is sure to be a bring smiles to you next awards ceremony!